The Pacific Jewel is a gem in the P&O fleet: Experience the magic onboard! The Pacific Jewel is part of P&O's Quantum class. This ship mainly cruises around the South Pacific in Australia and New Zealand. Voted best family cruise line 2014 by Out and About Kids Magazine, the Pacific Jewel is perfect for families and young couples with countless entertainment facilities onboard. You can expect to experience some thrilling new activities at Edge Adventure Park such as zip lining, rock climbing, bungee trampolining and lots more. 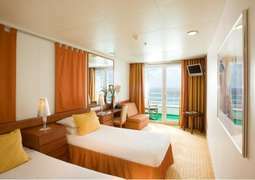 The ship also features a car simulator, library, pool deck and an aqua fitness centre. Relax and enjoy the Aqua Spa with a special treatment or using the thermal suite, sauna, steam room, heated ceramic beds, or tropical shower. There is guaranteed to be something for everyone in your family! Dine in the Salt Grill restaurant famous for its renowned chef, Luke Mangan. Or, if its nightlife you're after, Pacific Jewel won't disappoint! With 8 bars, karaoke, live shows, a casino and lots more, you will be sure to find something you like! Aboard the Pacific Jewel there are over 800 cabins and the vast majority of them are outside cabins and a quarter of which are balcony cabins. All of the cabins are furnished with modern fittings you would expect, while designed to be comfortable and functional for all passengers. The amazing service available to you on board gives you the perfect cruise adventure while still letting you feel at home. There are a great many choices for dining aboard the Pacific Jewel, no matter what kind of food you are looking for. The Salt Grill by celebrity chef Luke Mangan is a highlight on board, taking the freshest and finest Australian ingredients to prepare fine dishes for passengers to enjoy. Luna is an Asian dining experience offering banquet style menus featuring a variety of Asian cuisine. The Chef's Table is the spot for an exclusive dinner party where you join the executive chef for an experience you won't forget. The Pacific Jewel has a range of entertainment for all passengers on board, from the clubs and entertainment zones on board for younger passengers to the bars and clubs open to adults. Any one of the eight bars is perfect for dancing the night away while meeting other passengers, or if you prefer a quieter and more relaxed time then have a long hot soak in the Jacuzzis. Then there are a whole host of exciting activities like cooking demonstrations, photo and video studio, casino, cyber zone, deck games, performances (including cabaret and live music) as well as the duty free shop. The Oasis is the perfect place on board the Pacific Jewel to unwind, in an idyllic adult-only zone perfect for forgetting about everything and relaxing. The Aqua fitness centre is perfect for getting your heart pumping and the spa on board will help you unwind with a range of massages, therapies and treatments. The majority of the time the dress code aboard the ship is casual except for formal events as well as themed nights. The Pacific Jewel truly is a gem in the P&O fleet. She, along with her sister ships Pacific Dawn and Pacific Pearl, are favourites among Australian cruisers and frequent paradisiacal destinations such as the South Pacific and the Caribbean. The Pacific Jewel is over 800 cabins strong and can facilitate up to 1915 passengers and at a length of 254metres, she does so easily. 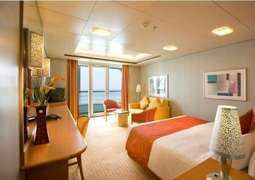 The vast majority of the cabins on board the Pacific Jewel are outside cabins which boast spectacular sea views and what’s more, a whopping 25% of these are balcony cabins! This means you can lounge on your balcony and breathe in that briny sea breeze while admiring the stunning vistas passing by. 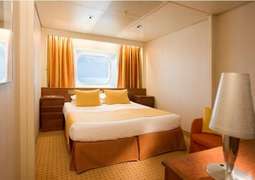 Of course, every cabin is equipped with the most modern and luxurious amenities such as en-suites, hairdryers, complimentary toiletries, air conditioning and more! Variety is definitely the buzzword when it comes to dining on board the Pacific Jewel. Passengers can choose between continental cuisines, delicious regional delicacies and satisfying classics from a lunch buffet or if that’s not for you, you can always head on over to the main dining room for an elegant experience. In addition, the foodies among you will be delighted to know that passengers are given the opportunity to dine at the Salt Grill, from celebrity chef Luke Mangan, where they can sample artisanal pizzas. Passengers of all ages and personalities are catered for upon the Pacific Jewel. The younger cruislings can take advantage of the different clubs and groups available to them and explore the ship through fun and engaging activities. For everyone else, there are a number of facilities and events just waiting to be enjoyed on-board the Pacific Jewel! Dance the night away at one of the eight trendy bars and meet other passengers in the process, or if you’d prefer a more relaxed atmosphere then have a go in one of the Jacuzzis. Aside from this there is a host of stirring activities like cooking demonstrations, photo and video workshops, a ritzy casino, a futuristic cyber zone, deck games, live performances (of cabaret and other genres of music) and don’t forget the duty free shop where you can indulge yourself a little. Fitness fanatics will have plenty of opportunities to maintain their regimes on-board the Pacific Jewel as the fitness centre is equipped with the most modern and sought-after work-out machines and the inspiring view of the sea doesn’t hurt either.